It is often said that the Tibetan Mastiff is the ancestor for all modern mastiffs and livestock guardians. Although it is important to note that this breed itself is not classified as a mastiff, despite it being named as such. Existing long before written record, bones and skulls found during archeological digs show evidence of dogs very similar in type dating back to the stone and bronze ages. The first written record of Tibetan Mastiffs being gifted to China is from 1100 BC. Isolated for centuries the Tibetan Mastiff bred true without outside influence. Some dogs were given as gifts, but it also accompanied ancient armies on their Eurasian military expeditions. It was during those travels that the Tibetan Mastiff would have created or influenced dogs kept by other civilizations throughout Eurasia. 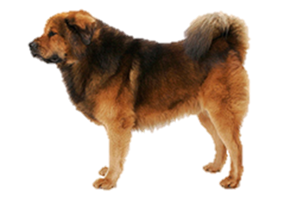 Some believe that the Tibetan Mastiff is the direct ancestor to the now extinct Molossus dog kept by the Greeks. The Molossus lives on in the modern Mastiff and through the Mastiff those genes pass on to many of today’s breeds. Is the Tibetan Mastiff Right for You?